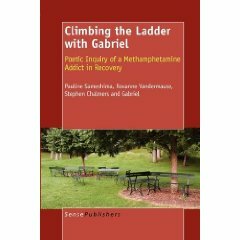 Climbing the Ladder with Gabriel demonstrates the power of photography and poetry to render the experience of methamphetamine addiction and recovery through the art of an interdisciplinary research methodology. Instructors, students, recovering addicts, and prevention/recovery advocates will find this a valuable resource. The authors of this remarkable work have opened the door for new ways of compiling and revealing what it means to be a human being caught in the dangerously perplexing problem of drug addiction and its fallout in a wide circle of social problems. By summoning up both a rigorous philosophy and procedural logic as a baseline and an artfulness that gives the bare bones of hard data a very human face, a heartbeat, and a voice that everyone can hear, they make a compelling case for such work in arts-based research and for pluralism in social science research design and methods. This is art caught in a handshake with science that matters. – Ivan Brady, Distinguished Teaching Professor Emeritus, Anthropology, State University of New York, Oswego. What a fantastic idea! What a great accomplishment! - Laurel Richardson, Professor Emeritus of Sociology and international leader in qualitative research, The Ohio State University. This poetic inquiry performs a vibrant testimony to the possibilities of personal and political transformation that can emerge in research that is heartful and artful. When we collaborate creatively and lovingly, we can find the ways of bountiful hope for living together with health. - Carl Leggo, Professor and Poet, Language and Literacy, University of British Columbia, Canada.